Looking for more inspiration using this weeks sketch, click the Bloggers Challenge Logo on my sidebar to see what the other players created this week. 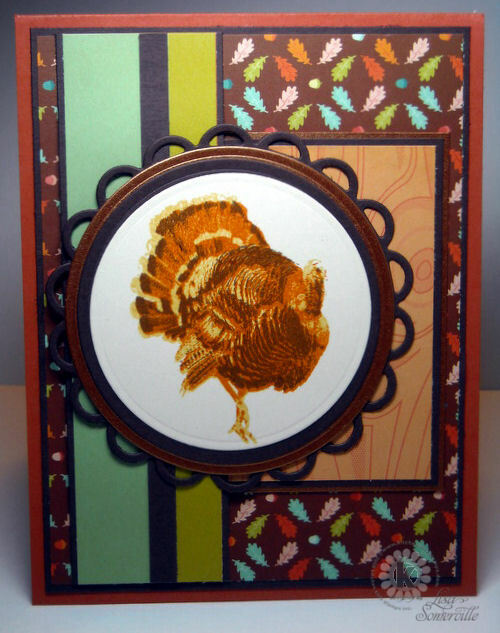 Gobble Gobble... Love the turkey and the papers you used including the perfect accent of the wood grain! I guess the real good news is that you are a head of the game on your next few cards, lol. Love this. Love anything you make with these stamps. Great card! gobble, gobble, glad to know I'm not the only one with a messy desk today. I'm at the finish line though so tomorrow I will be refreshed come 5 o'clock. Great card, this was a challenging sketch for me as I only have one set of oval nesties and not one big enough for any images I wanted to work with, but I loved it! Excellent Thanksgiving card, Lisa. Our Thanksgiving was in October. Hope you enjoy yours. Awesome Thanksgiving card. Love that turkey (my favorite turkey stamp) The rich background colors just pop. Mr Turkey looks awesome standing there in all his glory, whaaaa, just thinking about him makes me wanna' buy cow for TG dinner! Beautiful colors and card GF! Beautiful Thanksgiving card! Love that turkey and your layout is as always perfect! Have a wonderful weekend! Tom Turkey looks quite handsome strutting his stuff on this wonderful Thanksgiving card. Great papers, love the tree one. Very cute. I love the scallop detail edging on the circle. It really makes the image pop. Love the image -- it jumps right out at me! Great take on the sketch! TFS! Fantastic turkey card!!! I love your take on the sketch! Love your turkey, I am roasting a turkey today, I can smell it now. My mom is anxious she won't have enough gravy so I'm doing a turkey for sandwiches all this week so she can have the gravy for turkey day. That turkey of yours looks like he could walk right off that card. 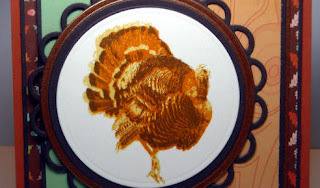 ohhh...Lisa that turkey just pops off the page with that DP...love it ...thanks for the challenge..great sketch. You always do an amazing job with Kitchen Sink stamps, and this one is certainly no exception! GREAT card...perfect for this layout. 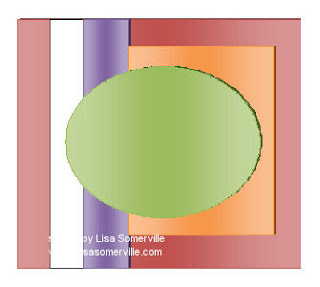 Fabulous job with the multi-step turkey image, Lisa! FUN!!! Makes me miss my Turkey Trot set!! Wonderful card Lisa...love the turkey! Love those papers Lisa! Gorgeous work and great take on your sketch! Have a great day!